Expand your 4K/8K routing freedom with 12G-SDI I/O and gearbox support offering the most inputs and outputs. The MFR-5000 Series is a group of multi-format routing switchers supporting 3G-SDI, HD-SDI, SD-SDI, ASI, AES and RS-422. Inside the 8 U case a matrix of up to 128 inputs/128 outputs can be configured. Since routing switchers are the core of large video systems, we have engineered a variety of features to ensure full redundancy. CPU board redundancy (option): a secondary CPU board constantly monitors the operation of the primary board. If the secondary CPU board detects any faults, operation is immediately switched to the secondary CPU to allow for continuous operation without down time. Redundant power supply (option): in the rare event of a power supply problem, the second supply takes over to avoid any interruption of router function. Network redundancy (option): a secondary Ethernet connection provides back-up for system control. With CPU redundancy, each interface can also have a backup (for details see below). The input/output board has 16 channels and up to 8 boards can be installed together. As a result, matrices of up to 128 input/128 output can be configured. Take operation: after presetting crosspoints, press the Take button to change the set crosspoints. Link function: this can group and link multiple crosspoints. Level operation: level switching allows separate control over different subject types. Monitor out: enables output of any destination source to a dedicated monitoring channel. Fully independent switching: a single unit can be used as multiple routing switchers by making multiple matrix partitions. This is effective when you wish to do multiple operations while avoiding source sharing. The interface expansion unit lineup includes two types to suit your specific application. The number of units that can be connected is a maximum of 128, including the remote control units. Provides an interface for GPI control. This 1 RU sized unit is equipped with user-assignable GPI/O (128 channels) and 4 serial ports (9-pin D-sub male). It can be used for setting Input/Output and supports system configuration. MFR-TALM is a device for performing central management of tally and material names of the MFR main unit and peripheral devices (such as video switchers and multi viewers). In the tally linking system like the one shown to the right (Fig. 1), MFR-TALM performs the tally calculation, which were originally performed by the MFR main unit, so that the tally linking can be speeded up. Multiple remote control units can be combined to make them function as a large scale control panel. 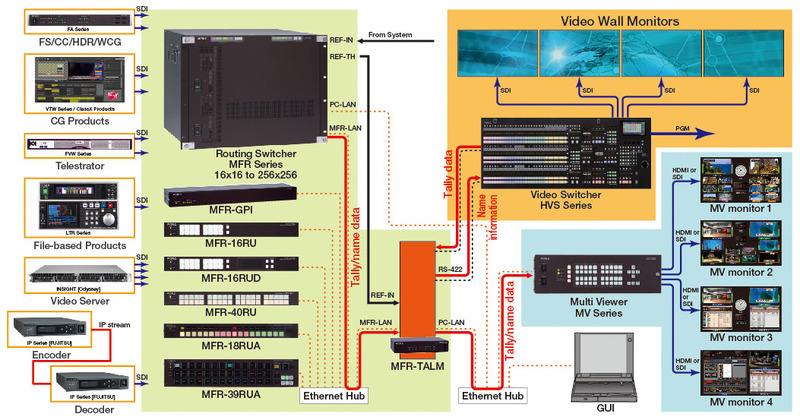 The MFR-5000 enables tally linking with FOR-A’s video switcher HANABI Series and multi viewer MV Series. And when switching between sources on the MFR-5000 side, the source name displayed by the video switcher or multi viewer can also change automatically. It supports TSL and Harris protocol, enabling linkage with 3rd party equipment.